“Below 40 S there is no law and below 50 S there is no God” … these were the words shouted to me over the screaming wind and through the driving sleet of the Antarctic winter. Although a corrupted quote (the original attributed to American writer Kim Stanley Robinson), Patrick had perfectly captured the conditions of the harsh environment in which we found ourselves; squinting into the wind attempting to spot a flutter of a speeding wing or the fine mist of a whale blow. 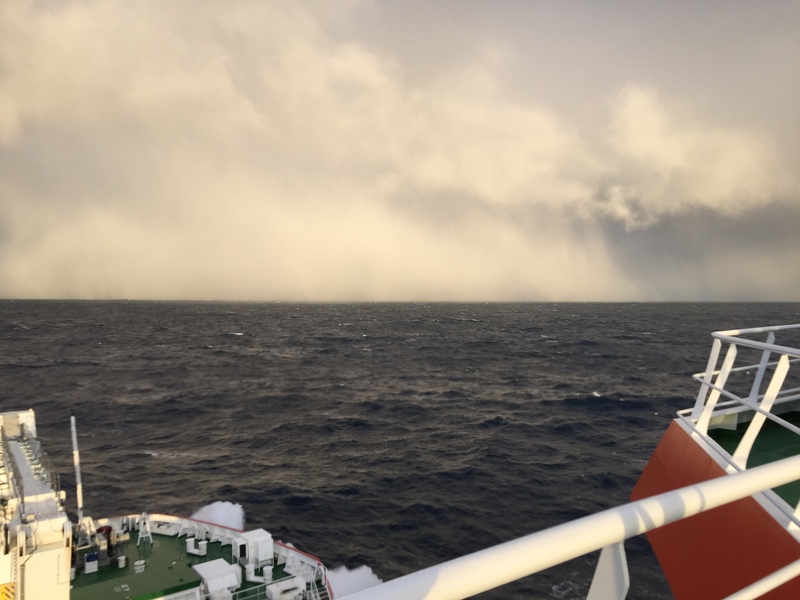 Aboard the SA Agulhas II, we were bound for the Marginal Ice Zone (MIZ) of Antarctica and I was receiving my introduction to birding of the most extreme nature. Attempting to spot and identify birds gliding low and at high speeds across the turbulent water from a rolling observation deck situated approximately 30 m above the sea’s surface was a challenge in itself but for a somewhat birding novice, it was overwhelming to say the least. Challenge was enthusiastically accepted! 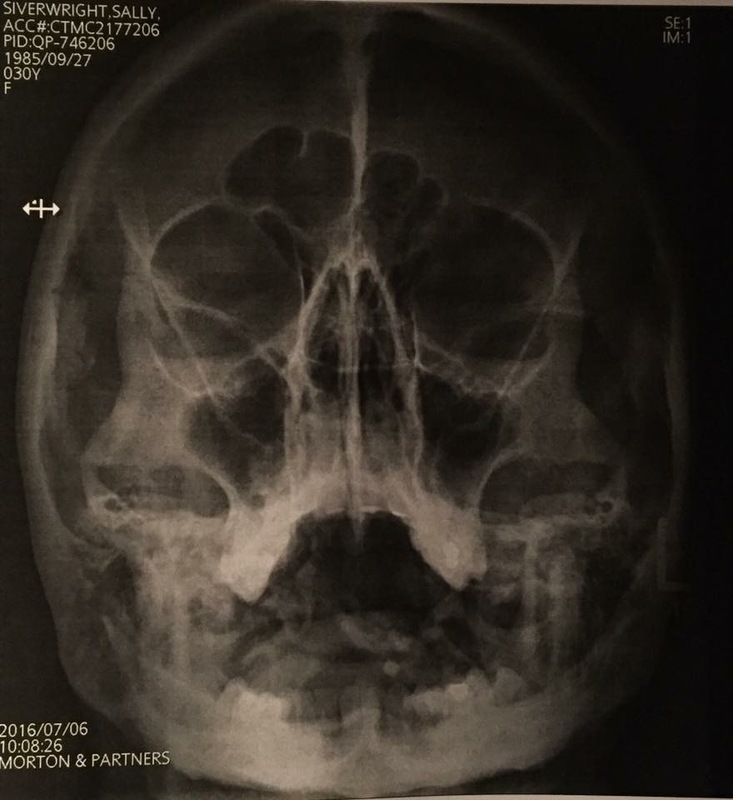 My first “Skullfie”, taken after an alarmingly intrusive medical! The SA Agulhas II (RV) is a South African icebreaking polar research and supply vessel that routinely ventures into the black, frigid sub-Antarctic and Antarctic waters carrying teams of scientists exploring various astronomical, biological, chemical, geological and physical aspects of the southern polar regions. The list of contributing institutions for this mission read like Alphabet Soup with institutions such as CPUT, CSIR, DAFF, DEA, NWU, SAWS, STS, UCT and UWC; along with BirdLife South Africa, Coastal Marine Technology and the Norwegian Meteorological Institute, contributing members to the final 2016 Winter Expedition Team. The purpose of my presence on board this Big Red Taxi of the South was to carry out cetacean observations for the Department of Environmental Affairs (DEA) as well as to learn from and assist the BirdLife SA Crew with their seabird observations, ultimately contributing to the Atlas of Seabirds at Sea (AS@S). Standing quayside and watching as the various groups began their trek up the gangway, I made the alarming observation that many members were carrying hacksaws; later established as the “Ice Team” but at the time, for me, signifying the opening scene of a massacre-at-sea style horror movie. In an attempt to increase our chances of reaching the MIZ, our departure was brought forward by two days and as such, the first day was spent waiting for the ship to be readied for our embarkation; surprisingly a mere few minutes spent at Immigration getting our passports stamped. 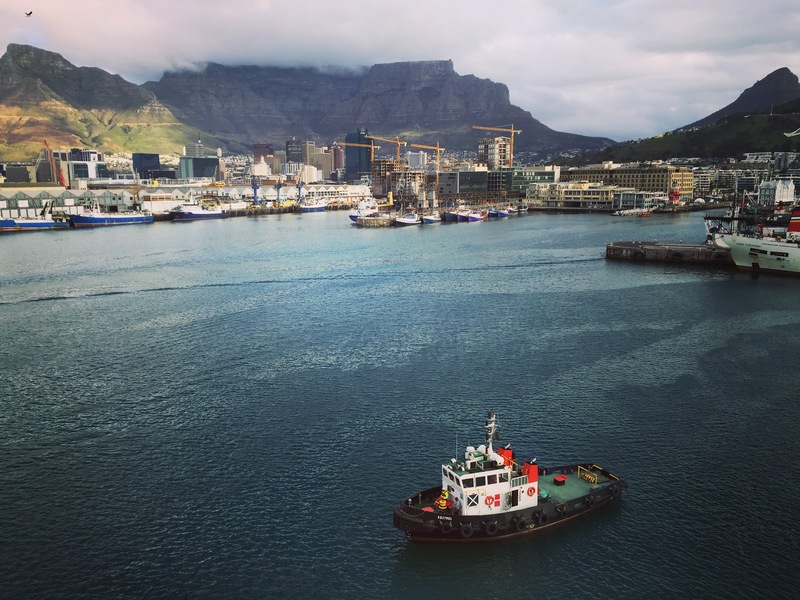 Departing Cape Town at 16h30 on 15 July 2016, with the sinking sun at our side, we sailed out into the open ocean leaving land and its stresses, quickly melting into insignificance, far behind. 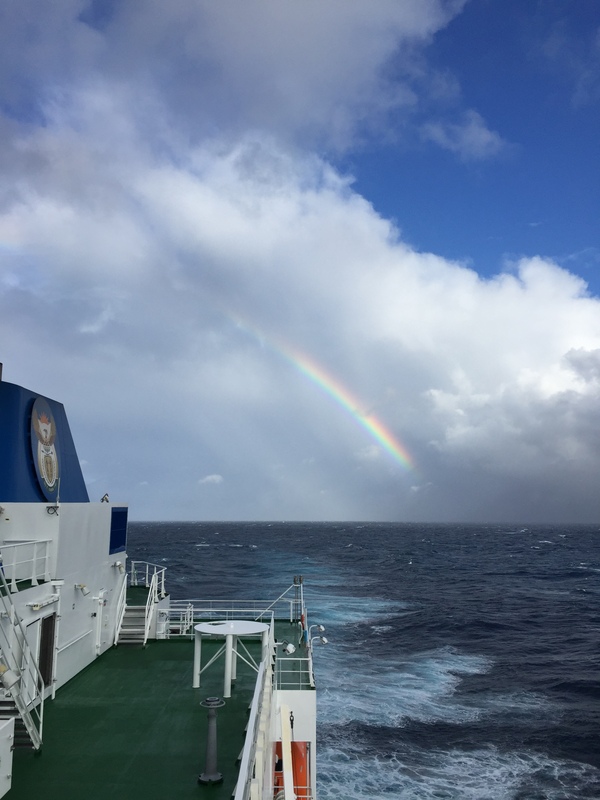 To say that I was excited about this trip does not do justice to the feeling of euphoria bubbling up as we began our voyage south; to finally be standing on her deck and gazing out across her bow, after so many setbacks, revealed a strong sense of place. I was brought swiftly back down to earth by the squawking of alarms calling for our first emergency drill. After mustering in the dining saloon and enduring the life vest demonstration, we were informed that if anyone was late to a drill they would have to don the “suit of shame” (neoprene immersion suit), hike up to the bridge and explain to the Captain why they looked like an Oros-inspired space man. Packed like sardines became a very real concept when entering the large confines of the lifeboat, which easily conjured up the claustrophobic scenes from the Captain Phillips movie. 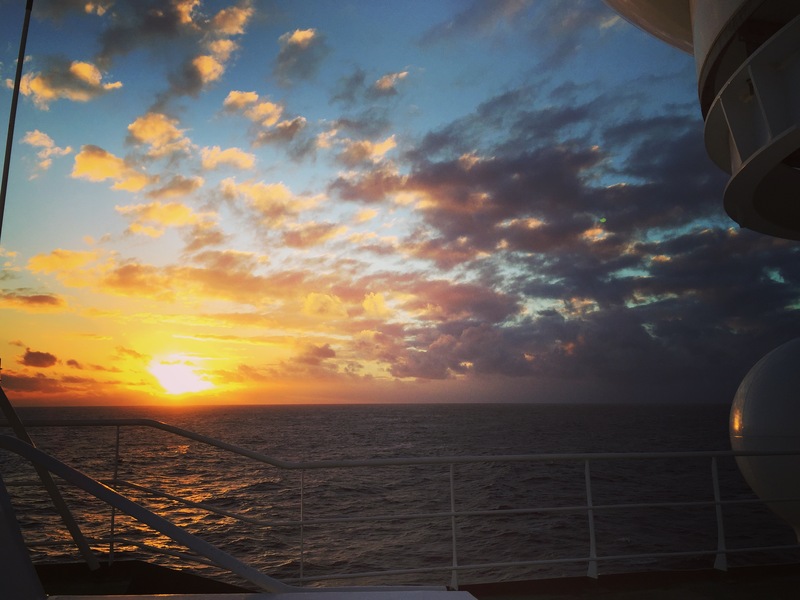 Life on board quickly settled into a routine dictated by meal times and shift work. When faced with the extensive menu detailing such options as flapjacks, drunken chicken, bloody Mary soup with bruschetta and vanilla puffs; I envisaged, on return, being rolled back down the gangway or hoisted over the side by the crane! Dinner on board SA Agulhas II requires adhering to the age-old tradition of respectfully dressing smartly to enter the dining saloon; which gave me grand ideas of dressing up in long gloves, my Grandmother’s gothic cloak and possibly a tiara. That was, however, until I was confronted with the logic-defying task of attempting to cram Antarctic-winter-worthy clothes into the very limited space of my buckling suitcase. Warm clothes won, but only just! Besides the impressive menu, the equipment afforded to the team was nothing short of cutting edge. The accommodation, comfortable with the Captain even installing heaters in the Monkey Island Observation Booth as apparently, “the novelty soon wears off”. Now all that was missing was a couch and a coffee machine! 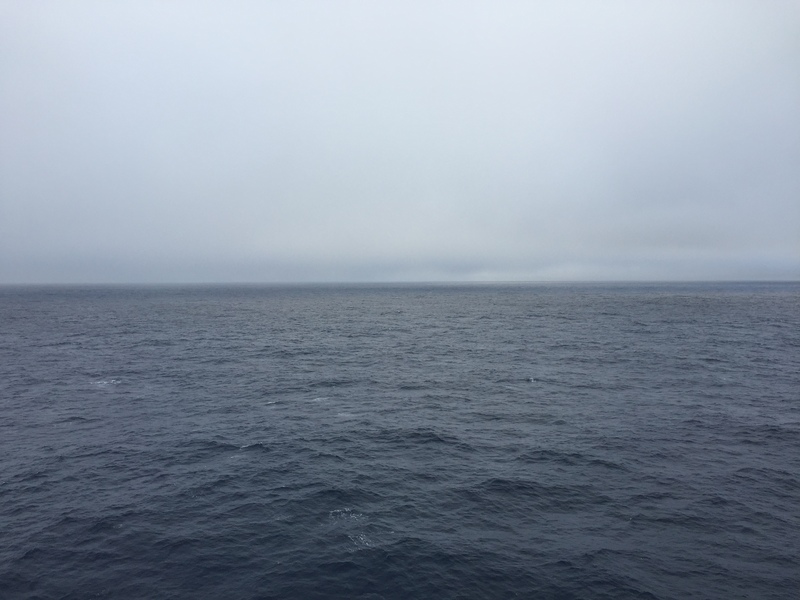 By 09h00 the following morning we were 176 km from South Africa and cruising at a steady13 knots. 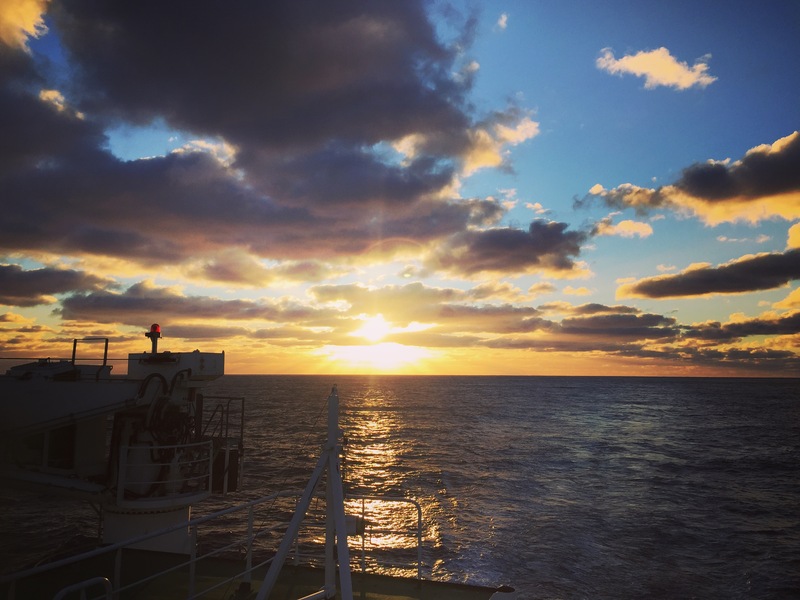 I had experienced my first SA Agulhas II sunrise, had spotted my first shy and wandering albatrosses (Thalassarche cauta and Diomedea exulans) and had come to the swift realisation that it was really hard not to be enthusiastic about the seabirds, especially when surrounded by the BirdLife SA Crew. 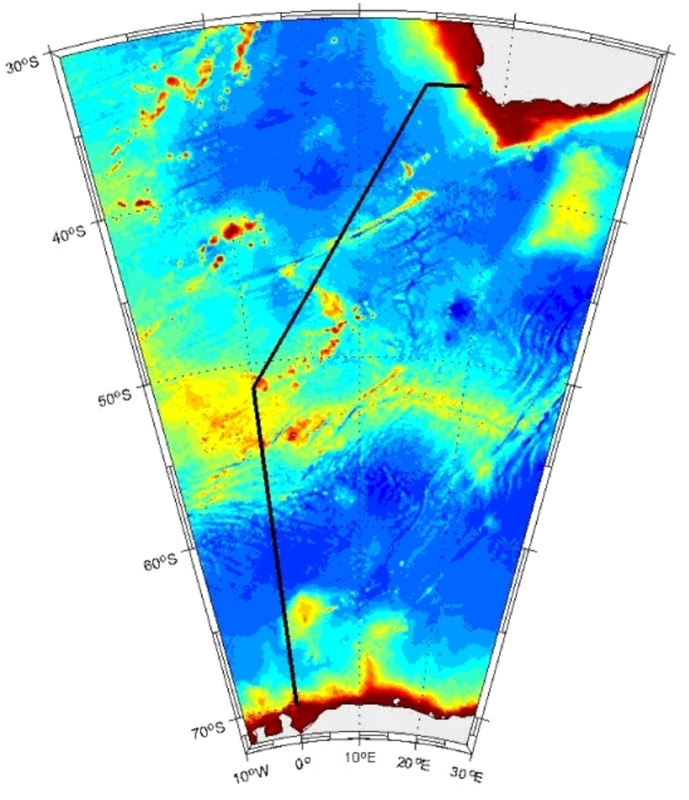 The course set for the expedition was to follow that of the Good Hope Monitoring Line (Figure 1), a transect running south-west into the Southern Ocean, between Cape Town and the Antarctic Neumayer Station 2372 nm away. 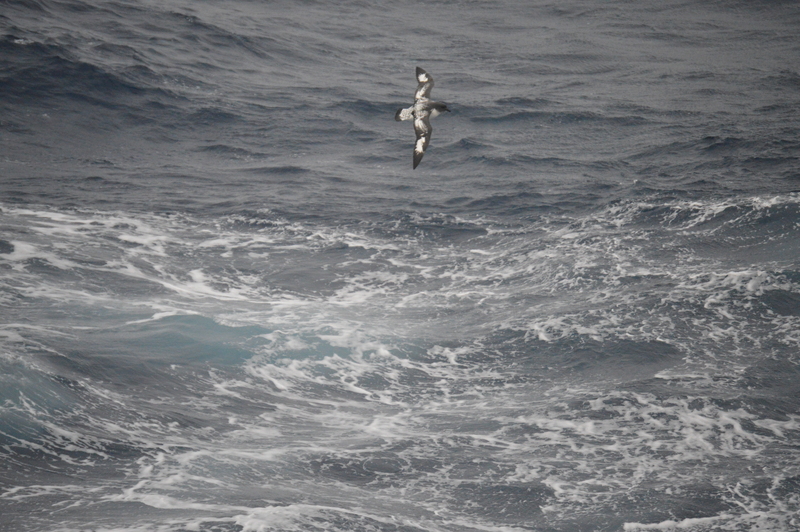 There is limited knowledge available on the seabird species inhabiting this harsh environment and as such, BirdLife SA, using the AS@S Protocol, aims to collect data pertaining to the distribution, abundance and seasonal movement patterns of Southern Ocean seabirds at sea. 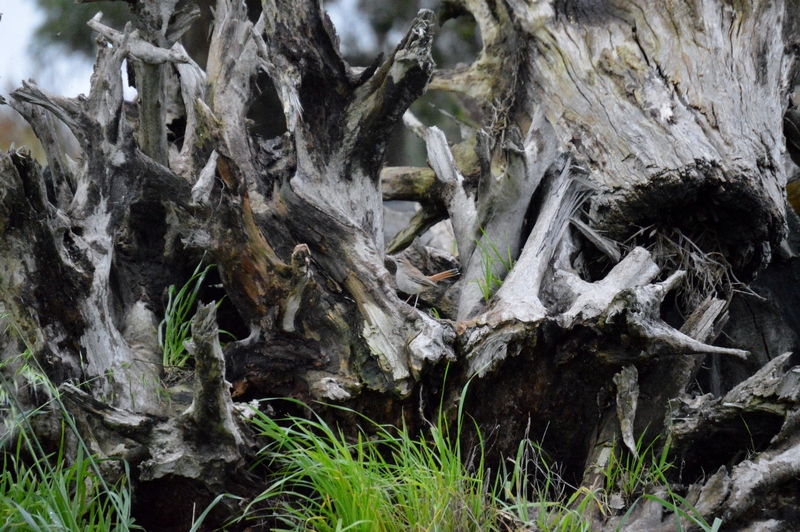 The AS@S Protocol, initiated in 2009, is a collaboration between BirdLife SA and the South African Environmental Observation Network (SAEON), which collates the contributions collected by ‘citizen scientists’, making the data available to the public through an open-access database (http://seabirds.saeon.ac.za/reports.aspx). Figure 1: Good Hope Monitoring Line (Speich et al. 2012). The 180 degrees view afforded by our elevated vantage point positioned above the bridge ensured that the effort-based 10-minute transect counts could be carried out with relative ease. 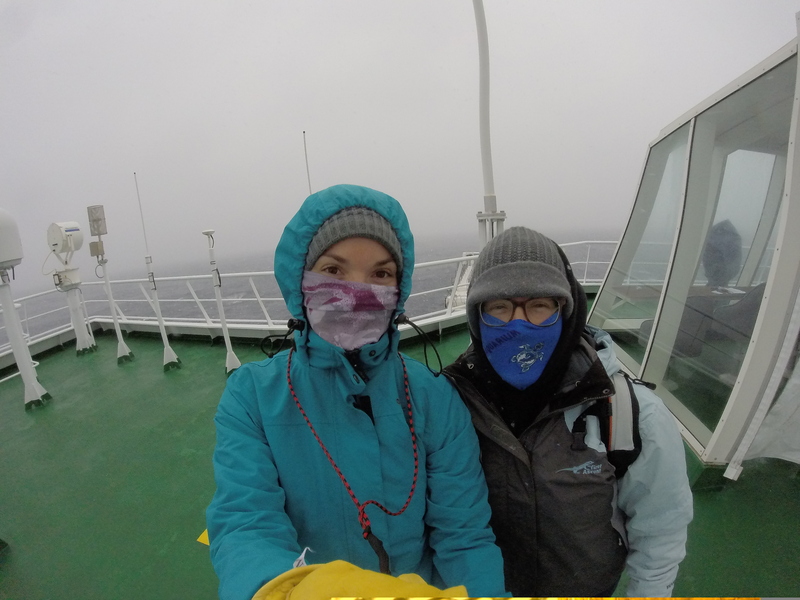 In the case of our view being obscured by either bad weather or a strong reflection from the sun (a rather optimistic thought for the Southern Ocean in winter), our sampling field would be reduced to 90 degrees. Ship followers such as Shackleton (Antarctic petrel), Magellan (southern giant petrel) and Johnny (blue petrel) were noted separately. The BirdLife SA Crew (Andrew, Dom, Justin and Patrick) were an awesome group of enthusiastic guys that taught me a whole “oodling” heap about birds and the banter keeping me entertained during the endless hours when the ocean seemed devoid of life. After four days of only the ship followers to keep us company and with only the ice pancakes to fragment the monotony, Justin declared that he would rather endure childbirth than sit there for a further 10 minutes. It was interesting to observe that these seabirds seemed to congregate in pockets of feeding/resting activity, often seen to be exploding off the surface (well, exploding might be a fairly generous term when applied to the cumbersome take-off of albatrosses and the like) when the ship intercepted their gathering. The 50s seemed relatively empty when compared to the longitudinal bands of the north, hence the conversation about the merits of childbirth being preferential over seabird obs. 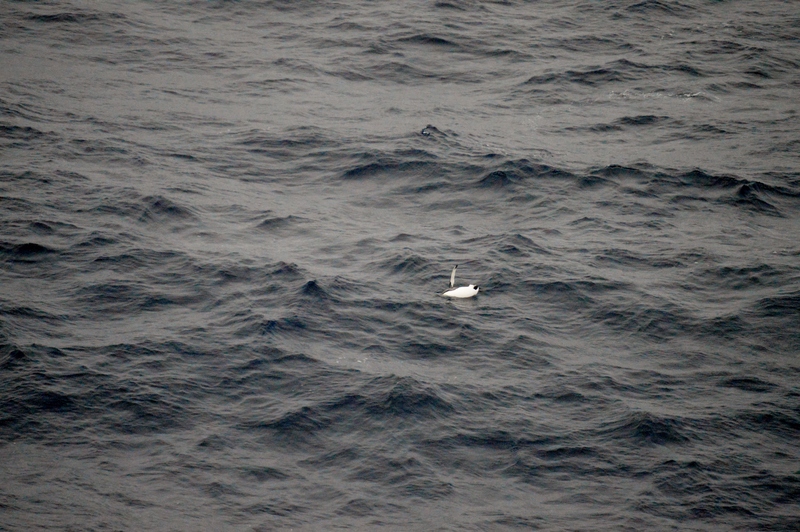 While still steaming through South African waters (the “demarcated” Exclusive Economic Zone – EEZ) a fair few noteworthy species were recorded; white-headed and Atlantic petrels (Pterodroma lessonii and Pterodroma incerta), grey-headed and sooty albatrosses (Thalassarche chrysostoma and Phoebetria fusca) and the Kerguelen petrel (Pterodroma brevirostris) which was last seen within the sub-region waters 15 years ago. 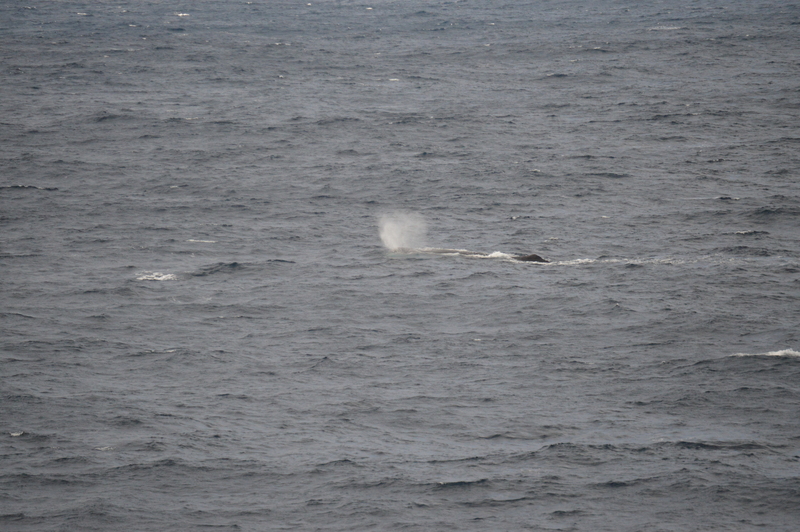 Seabirds were not the only animals being observed from the Monkey Island; at 10h55 on our first-morning watch we spotted six sperm whales (Physeter macrocephalus) cruising passed, their bulbous heads and 45 degree spray being key diagnostic features. By this point I had started to positively identify the albatrosses gliding below, I realise that this is probably the equivalent of identifying an ostrich amongst a flock of pigeons but I took it as a win! So all in all a good first day, which was completed with a jug of tea and an exploratory mission to the library. Ensconced in my little sanctuary, surrounded by such titles as Franklin of the Arctic (Richard S Lambert), Quest for Franklin (Rear-Admiral Noel Wright), Nansen the Explorer (Edward Shackleton), Hell on Ice (Commander Edward Ellsberg) and Frozen Ships: The Arctic Diary of Johann Miertsching (1850-1854) – Translated by LH Neatby, accompanied by an old stack of Shipping News got me thinking about the intrepid explorers and early seafarers venturing into the unknown. Sailing the uncharted waters of the world’s most temperamental oceans, armed with only the artistically detailed maps depicting their limited geographic knowledge and fortified by a sense of adventure and most importantly, rum. My romanticised impression of rum-fuelled, adventure-filled expeditions across uncharted waters is probably a vast distance from reality, the truth being more aligned with scurvy, a high incidence of shipwrecks and mutiny as and when the mood took. Even when taking the more accurate conditions into account, the sense of achievement when sighting new territory or a previously undescribed species must have been thrilling although maybe it was surpassed by the total relief at surviving an against-the-odds voyage. While I acknowledge the substantial contribution that GPS has made to species monitoring and global mapping, I often feel that it has diminished our sense of adventure of embarking upon a journey with no knowledge of where you might end up. I find knowing where we are at all times, instead of following the stars or riding the currents to see where we end up, rather dull and unimaginative. That being said, standing on the deck and contemplating the moods of the ocean, dynamic conditions that can shift from relatively mild to Perfect-Storm crazy in an afternoon, I’m fairly certain that I would appreciate having access to a GPS and all the technology that goes with it if something were to go wrong. 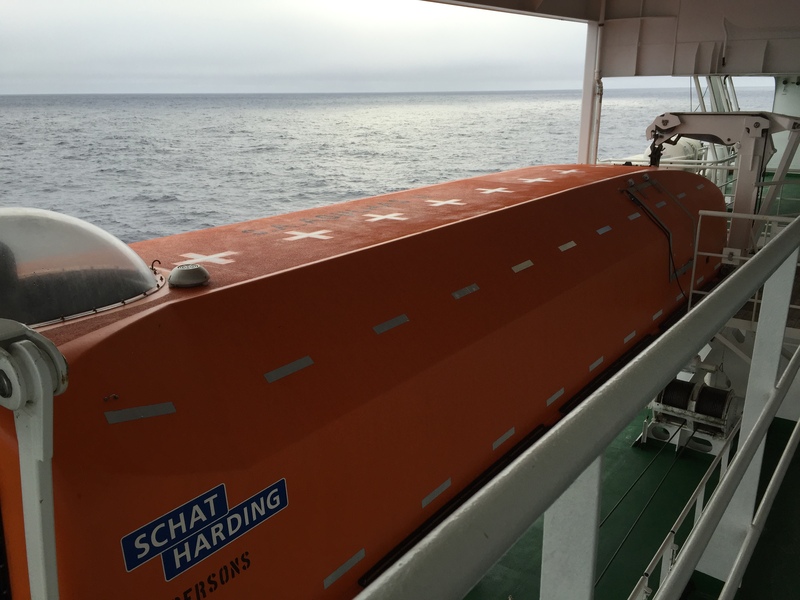 “Somewhere in the Southern Ocean” is slightly daunting as a rescue location so I wouldn’t hold out much hope of being found again; plus, there were only volleyballs on board and I’m not convinced that they are as good friend material as basketballs. 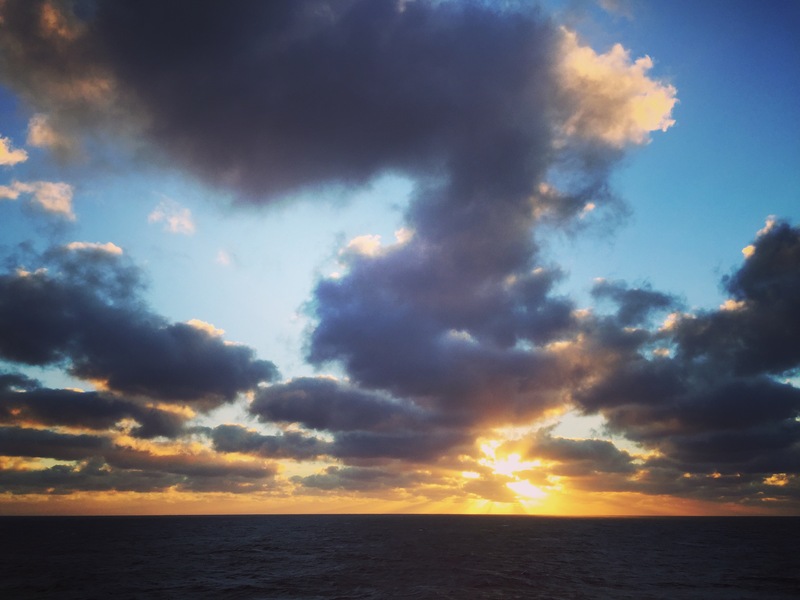 North-westerly swells and lashing wind, the gunmetal grey skies reflected on the black surface of a grumpy-looking ocean, was the scene that met me when I opened the hatch the following morning. I half expected the Flying Dutchman, with her shredded sails and creaking, waterlogged decks, to limp out of the thick enveloping fog. 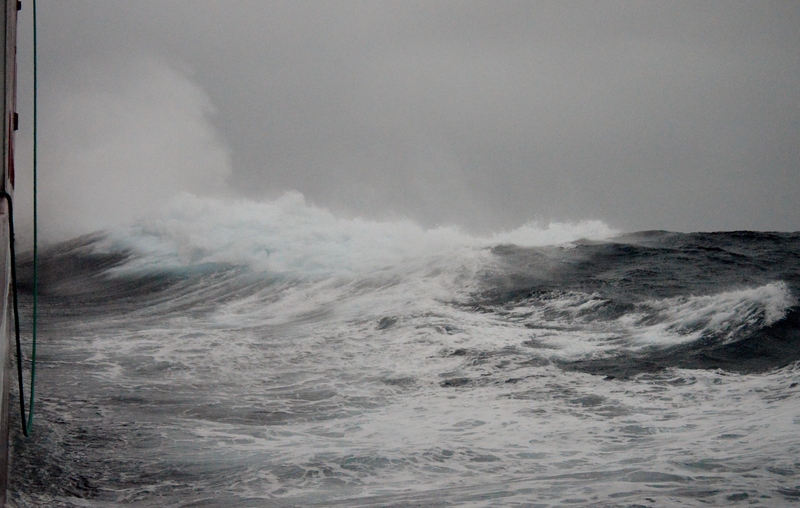 I’m almost sure that I heard a distinctly Scottish voiceover declare that we were roughly 9 000 nm SE of Dutch Harbour. The birds seemed to be enjoying the weather, swarms of prions (Pachyptila sp.) 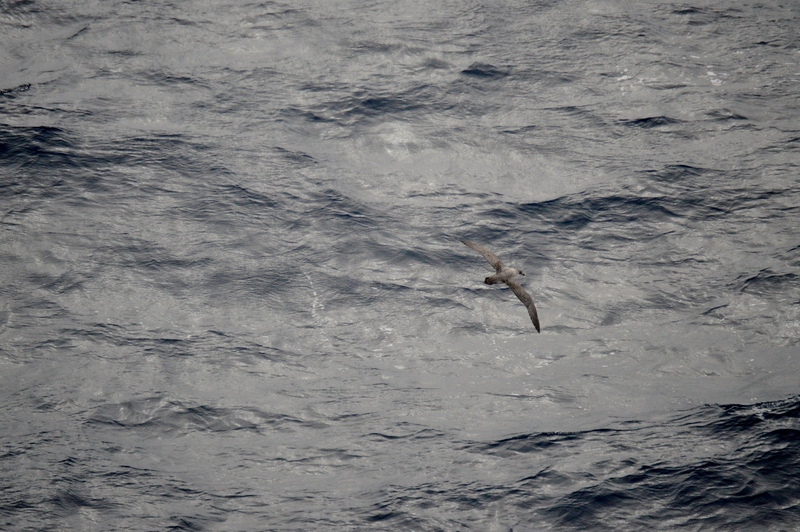 and pintado petrels (Daption capense) riding the thermals and disappearing in the troughs between the oncoming swells, camouflaged against the white caps of the cresting waves. Throughout the day we were joined in our heated seafaring un-camouflaged glass-hide type observation booth by a steady stream of people keen to see their cherished species; and Karin, from North-West University, who had the onerous task of attempting to spot plastic floating passed the ship. This was a widely discussed “Catch 22”; everyone was pretty happy when a day passed with no plastic being spotted. One of our daily highlights was listening to the lunch/dinner xylophone jingle broadcast over the PA system from the Bridge, Pavlovian Conditioning at its best. Silence would descend upon the deck as we listened to the assortment of tunes which, on completion, would receive our Simon-Cowell style assessment. We only found out later that the performer was not tone-deaf, one of the bars was actually missing. 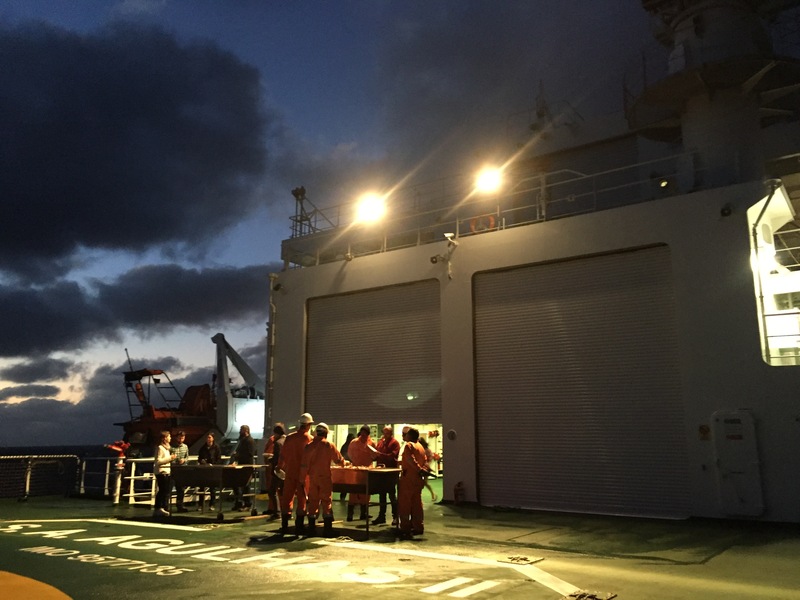 This tradition of alerting the crew to mealtimes has been continued from the SA Agulhas when a xylophone was gifted to the new ship upon launching. The afternoon shifts were long but made shorter by listening to Patrick’s fascinating tales brimming with interesting information; enjoyed while munching on chocolates smuggled up from the tuckshop. 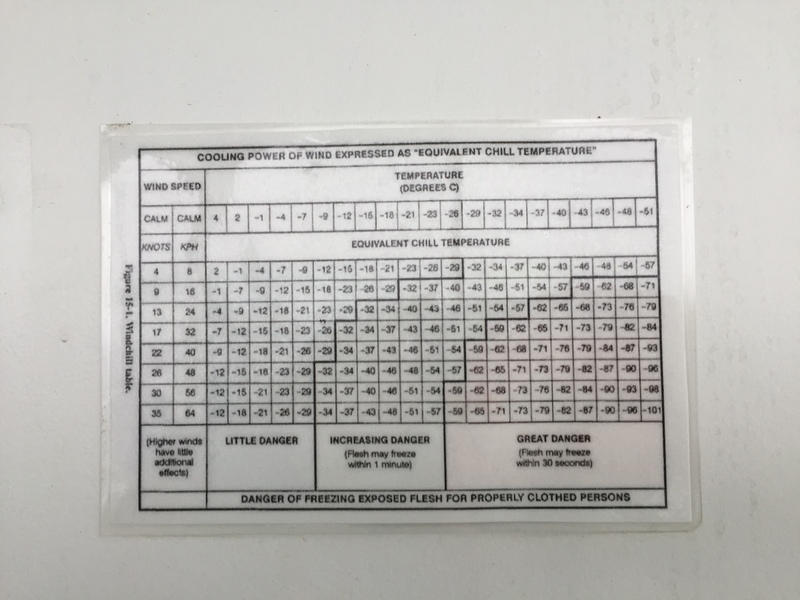 Another daily activity of ours was to check the Wind Chill Chart to see if we had ventured into the “Increasing Danger” section. Although perpetually stuck in the “Little Danger” section, we did on occasion flirt with the line, sitting on the precipice at -29 C. At one point the wind was said to be blasting across our bow at 54 knots, I walked around the corner and into the teeth of it to test the theory; I reckon it was an accurate assessment. 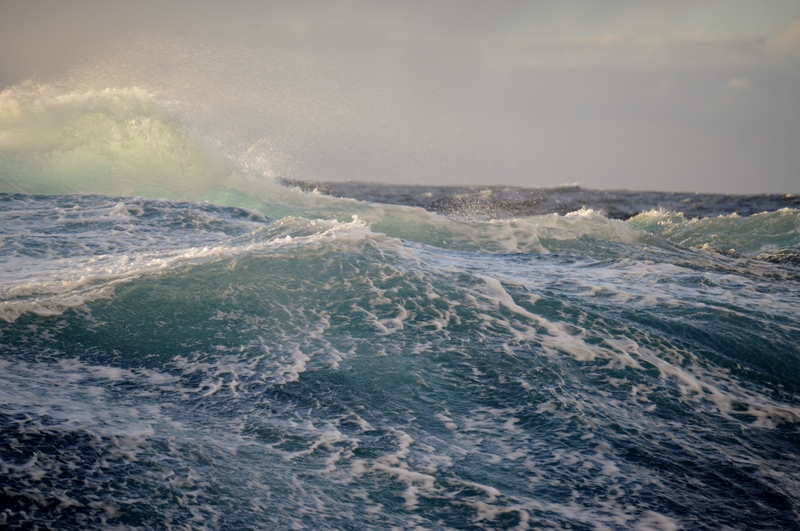 By this point, the weather had become a daily conversation topic, the relatively rough seas making tasks such as showering and sleeping rather interesting. On countless occasions I nearly ended up unceremoniously plonked on the bathroom floor after being abruptly ejected from the shower with a swift uncharacteristic roll from the ship. Flying spread-eagled into the wall, while trying to sleep and descending the stairways at speed became the norm. During the early hours of one morning I sleepily got up to use the toilet, opened the door and fell inside. The Roaring Forties were however a bit of a disappointment. I will probably regret these words on my next crossing, and there will be a next one, but after hearing for weeks prior to departure how this section of the ocean will be my undoing, I built up great expectations. Sailing across what resembled a wind-chopped pond did not meet my expectations of Perfect-Storm conditions. 3 000 m. Due to the fact that the birders stop observations while the ship is stationary, we headed to the Poop (originating from the French la poupe which translates to stern) and Heli Decks to capture a few photographs of the ship followers. I failed miserably. My lack of experience photographing birds that are changing direction at speed in low light conditions, on a rolling deck, in big seas produced the abysmal results of a few dark, blurry smudges in the distance. I gave up in disgust and headed inside for tea and biscuits. With a blizzard raging outside, you would never know it in your cabin; between the triple glazing and A/C, there is no need for a duvet let alone the five layers I was wrapped up in. 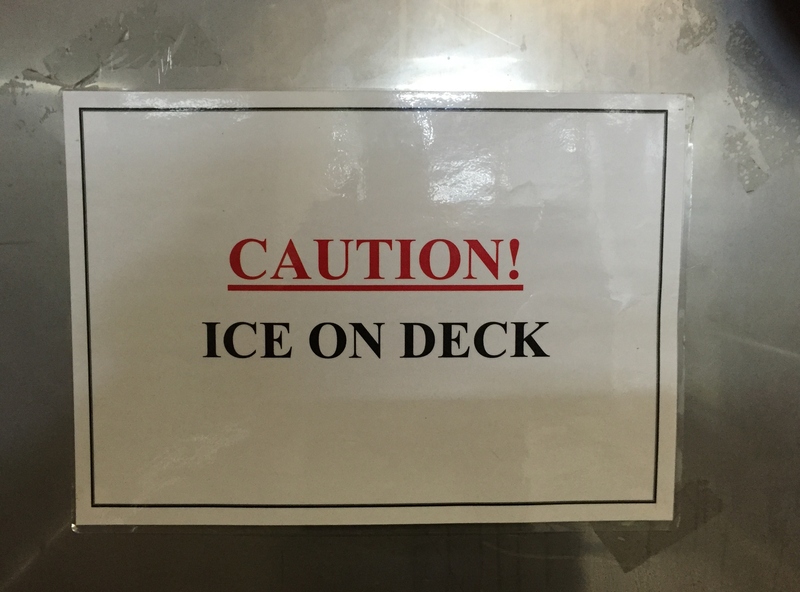 The multiple layers made walking up the stairways (between the Poop Deck on 3 or my cabin on Deck 6 and the Observation station on Deck 10) rather challenging as bending my knees became next too impossible. Vivid nightmares seemed to be a common occurrence amongst some of the team, Karin and I would have a debrief in the morning as she explained the bizarre events from some of her more colourful nightmares. 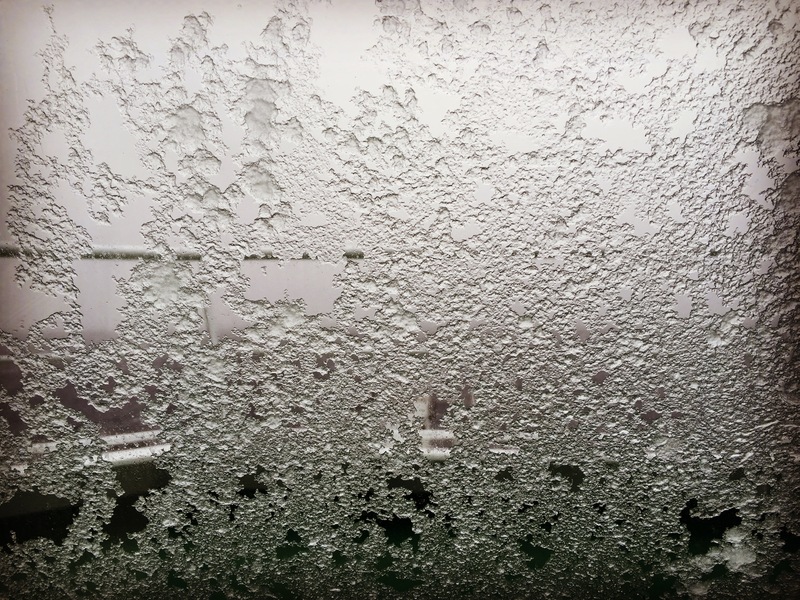 The decreasing temperature produced the added challenge of keeping the windows of our observation fishbowl clear. Every ten minutes or so someone would attempt to squidgy down the windows only to elicit such comments as; “I wouldn’t hire him to clean windows at my garage”, “There goes his tip, he’s only made it worse”. As it turns out, none of us have sufficient window-cleaning skills to fall back on if science doesn’t pan out. The sun made a rare and fleeting appearance that produced a beautiful full double rainbow under which we passed. A pot of cold could be seen at either end (yes, I see what I did there). 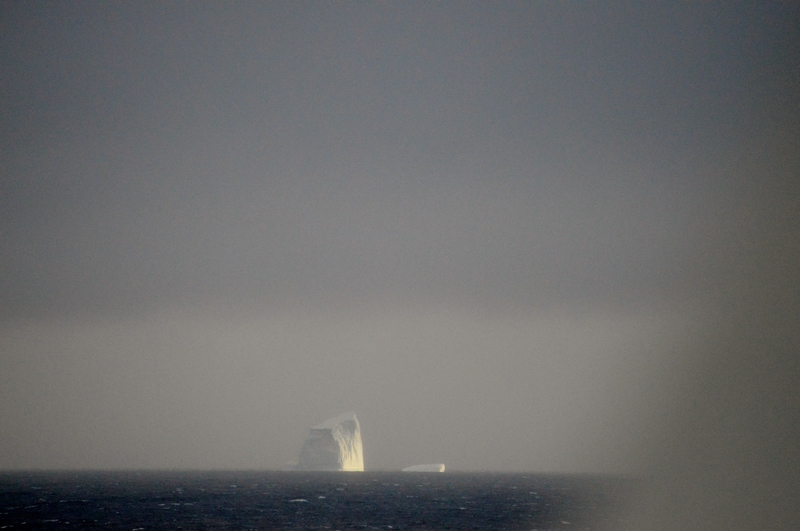 At 14h40 on 19 July we spotted our first iceberg on the horizon (25 km away). Darren, obviously so excited by the occasion, took a dive down one of the stairways when the ship yielded an awkward roll and in an attempt to save his camera, he dislocated his shoulder. The Doc was pretty chuffed with something (other than dishing out seasickness tablets) to do and pulled out all the stops. As the temperatures continued to drop I raided the lockers for snow gear and five days into our trip broke out the jacket, reducing my layer count to only three. It was never quite cold enough to don the chunky dungaree-style snow pants although it was probably just the thought of climbing up the seven decks dressed like a blue Oros mascot that put me off. Watching the advancing swell and the spray produced from the crashing bow shoot up into the air like a fountain easily becomes entirely mesmerising. The word “cold” does not come close to describing what the ocean looked like and it was astounding to think that the birds inhabiting this harsh region survive with the same thin layer of plumage no matter the season. 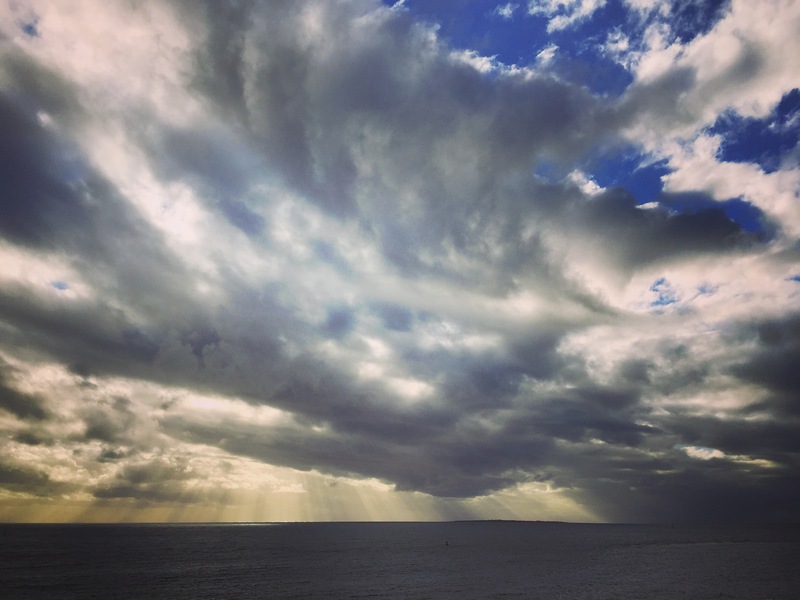 Squalls march across this ocean expanse, similar in number and attitude to soldiers marching into war. The ominous cloud banks approaching from the south dimmed the already limited light, suddenly plunging us into a pocket of darkness and driving sleet. Roald Amundsen aptly summed up my sentiments; “We must always remember with gratitude and admiration the first sailors who steered their vessels through storms and mists, and increased our knowledge of the lands of ice in the South” while Ernest Shackleton (The Heart of the Antarctic) was somewhat blunt and to the point in his description; “Our food lies ahead and death stalks us from behind”. “Below the 40th latitude there is no law; below the 50th no god; below the 60th no common sense and below the 70th no intelligence whatsoever” is the complete quote from Kim Stanley Robinson’s 1997 book Antarctica where he describes life at the McMurdo Station. One of my favourite quotes, from Estonian writer Juhan Smuul (Antarctica Ahead), states that “However poetic your soul, to whatever layers of the atmosphere your feelings soar, if you have no technical education and no real understanding of technology the only thing you are good for in Antarctica is to pull sledges”. We arrived at the pancake ice during dinner on 21 July and only after finishing dessert (there are priorities) did we layer up again and head outside for the longest photoshoot in the dark. With all of us hanging over the starboard side of the Poop Deck and gawking into the darkness, a soft white apparition glided into view. 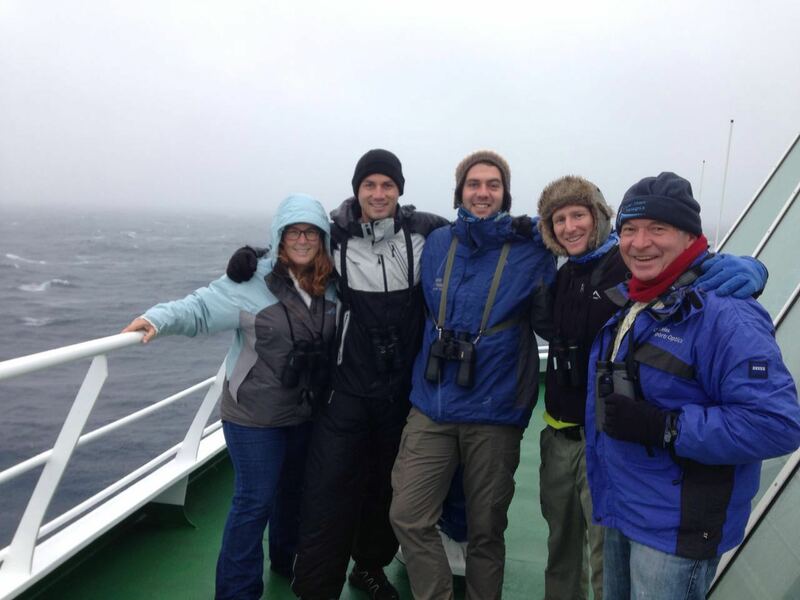 Our very first sighting of a snow petrel (Pagodroma nivea). To say that the appearance of this beautiful little bird was met with enthusiasm would do injustice to the sense of celebration experienced on the deck that night. 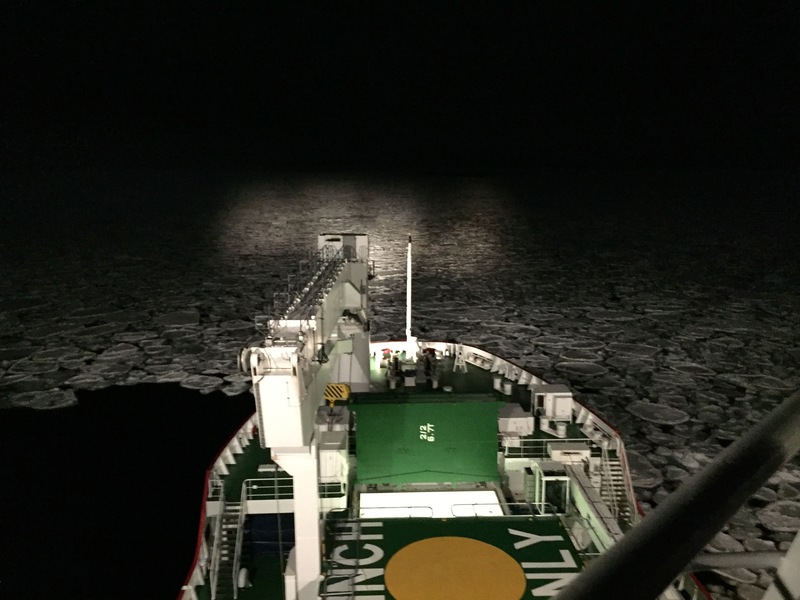 I stayed out on deck watching the moonlight shimmer across the black water and the ice sparkle as the slabs were caught in the lights from the ship. Despite the activity going on around the rest of the ship there was a stillness to the deserted deck, the swirling snow transforming the moon into a faint smudge and the penetrating cold burning against my skin. Out of the inky blackness there came a flash of white as the snow petrel, returning for another display, cut into view later to be lost to the surrounding darkness as suddenly as it appeared. A truly ethereal experience. 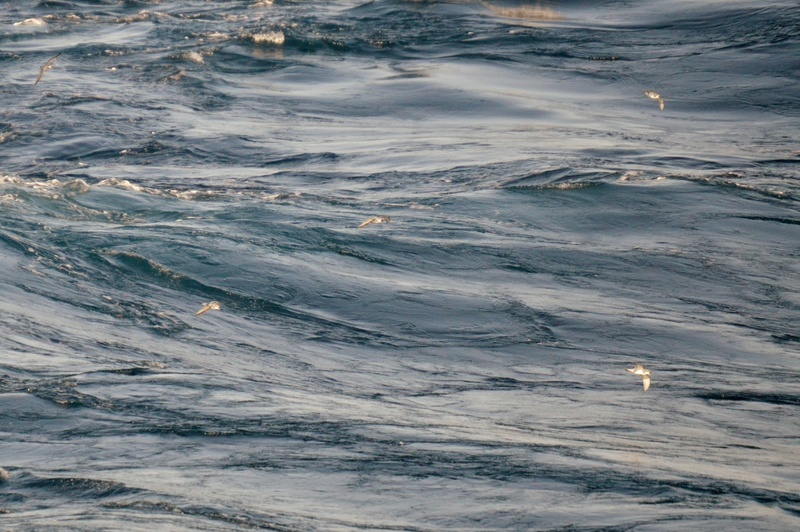 It is therefore not difficult to understand why Breton folklore maintains storm petrels (a species that we did not encounter during our trip) to be the souls of drowned sailors or the spirits of sea-captains, doomed to spend eternity flying over the sea as penance for mistreating their crew (Eyers 2011). Yay! 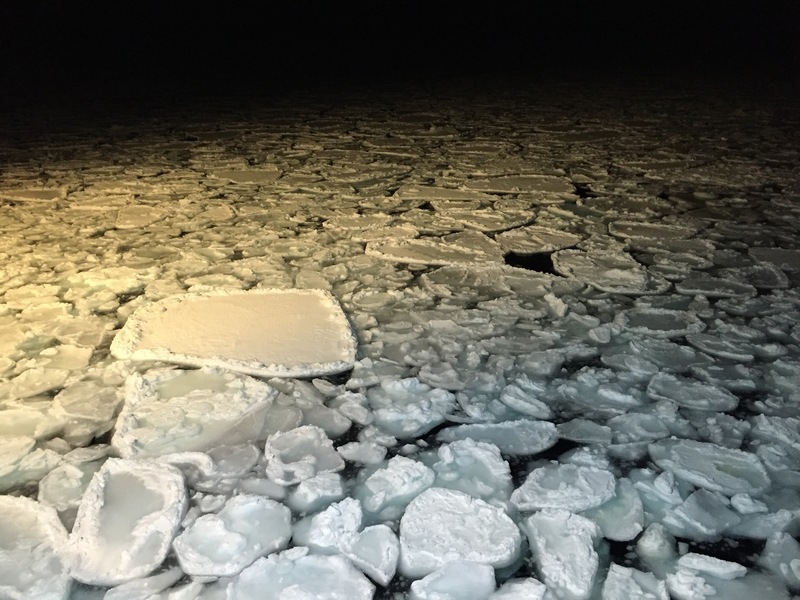 We’ve reached the ICE! 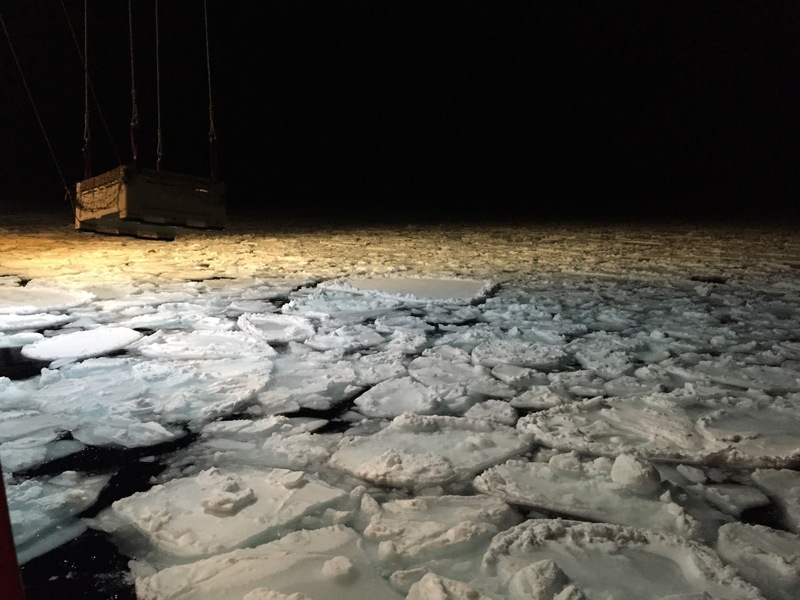 The Ice Team spent the night at the ice collecting samples, either hauling the pancakes over the side in a crate or being winched down in a basket to collect the samples by hand, and observing the ice…a truly impressive feat in the dark. 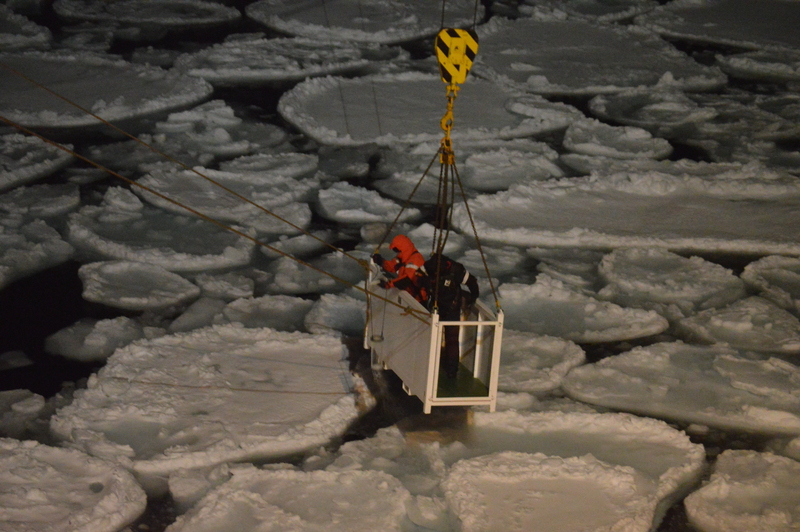 After the collections were complete, the ship was turned around and we began our journey home. Things were somewhat slow the following day with bad weather hampering observations. Dom was however awarded 10/10 by Patrick for his apparent blasé attitude at the passing of the bow by a sooty albatross, Patrick having charged out of the observation booth with his camera. We were again met by the curious Antarctic fur seals. For the duration of the trip, morning lectures and afternoon seminars were presented by various members of the team and could be attended by anyone interested in the topics to be covered. The morning lectures ranged in subjects from “Acoustics” (Fannie) to “Phytoplankton of the Ocean” (David) and “Moorings and Floats” (Tahlia) to “Water Mass Formation and Identification” (Howard). Our Chief Scientist, Warren, when not slaving away in the labs down in the bowels of the ship or entertaining us with his guitar skills, presented a number of lectures on gas exchange and productivity. The afternoon seminars included such topics as “Ice Observation” (Trond), “Gliders” (Fred), “Seabirds of the Southern Ocean” (Dom) and “Plastics in the Environment” (Karin). The “Basket Cases” (Thanks Howard)! In the evenings we would congregate in the Deck 6 Lounge to play cards and board games while listening to an eclectic mix of musical hits being impressively performed. On one of the evenings Andrew and his bagpipes, to the resounding echoes of “Scotland the Brave”, strode into the bar and proceeded to impress us with a set prepared for an upcoming competition. That has got to have been the most southerly point a set of bagpipes has been squeezed. Volleyball and table tennis, which took on a whole other dimension as standing still on a rolling ship proved to be a challenge, kept us busy in the afternoons before dinner. The evening card games included “Dobble”, a frustrating yet addictive game introduced to us by Emeline and the entirely addictive memory (or not, as the case so often was) game, “Cabo” … thanks for that Devin! The remaining nights on the ship ending in the wee hours as a result. David and Howard gave “Bridge” lessons, no blue rinse required, with Jatin adding his own special brand of rules and shuffling to the mix. The crew accommodated a group of us interested in the mechanics of the Engine Room, the Chief Engineer taking us on a tour of their impressive stomping ground below decks. A braai on the Heli Deck (as only South African ships can) marked the beginning of the end of the trip for us. This was followed by a dress-up party where the short notice and limited resources resulted in some truly ingenious costume ideas. From a colourful nudibranch to the Indian Ocean, from “under the sea (C)” to the red tide and from a snow petrel to a new species of giant penguin. The following day saw us re-entering South Africa’s EEZ and despite the heavy swell, a number of important species were spotted. By this point, the birders were eager to dock as for the past ten days they had been receiving daily updates of a special little bird suffering from reverse migration and chilling at Zeekoevlei in Cape Town instead of the warmer climes of northern Africa. This rufous-tailed scrub robin (Cercotrichas galactotes) was to become my twitch. Looking back… one of my favourite moments has got to be the sleeping king penguin (Aptenodytes patagonicus) spotted off the starboard bow. One flipper in the air and riding high in the water, I thought for a moment that it was dead. It was soon woken up, rather rudely, by the passing ship, it and its mate porpoising off into the distance. 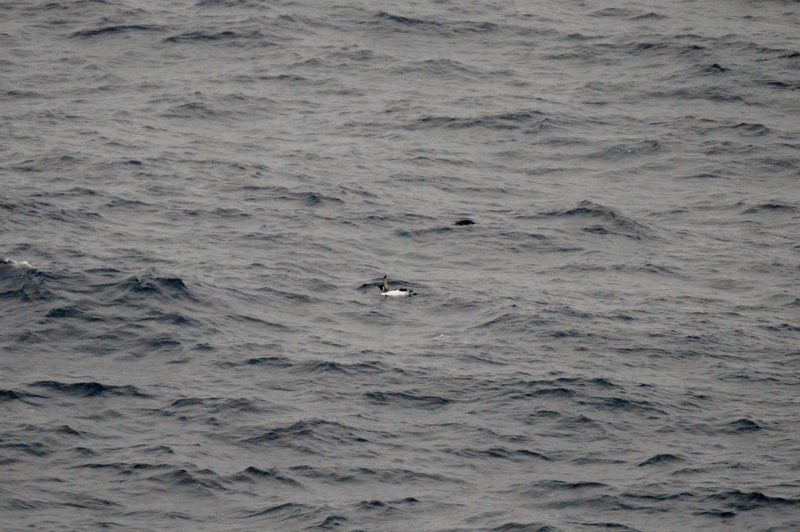 Sadly; no orcas were spotted on the trip, we did however encounter a small pod of southern bottlenose whales (Hyperoodon planifrons) and chinstrap penguins (Pygoscelis antarcticus). Almost as a farewell flyby, Shackleton put on an impressive aerial display (apart from the moment that he nearly collided with the lightning conductor) allowing some of us to get some quality shots from both above and below. I’m not sure what decided me; if it was listening to Dom recount his 5 600 km journey to see a yellow-throated leaflove (Atimastillas flavicollis) near Zambia or Justin bringing his “worst birding moments” to life in a series of hilarious “what-can-go-wrong-will-go-wrong” tales; either way, I decided to officially start making my “List”. I’m not quite at the committed “spend three nights under a tree living off All Bran and long-life milk” stage but I’m definitely seeing the light. After counting up the species I have previously marked off in my bird book, I totalled 196, Dom vowed to get me to 200 by the end of the trip. 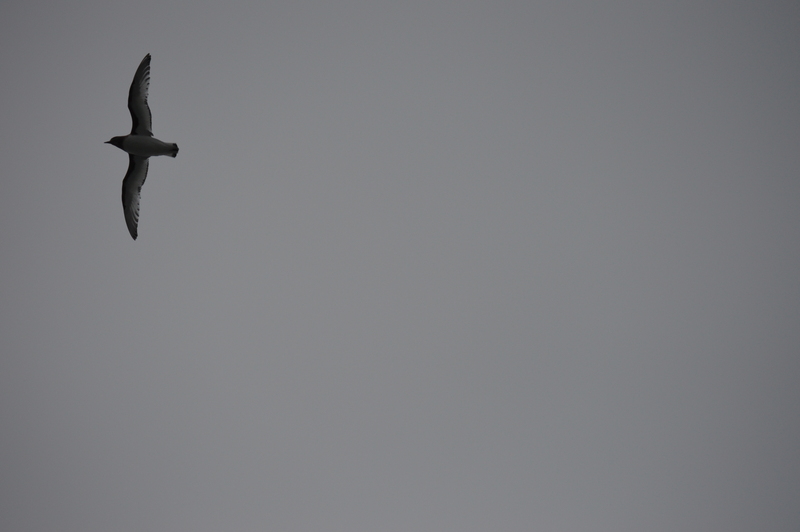 We reached that milestone the following day, with a broad-billed prion (Pachyptila vittata), and I did a happy dance. 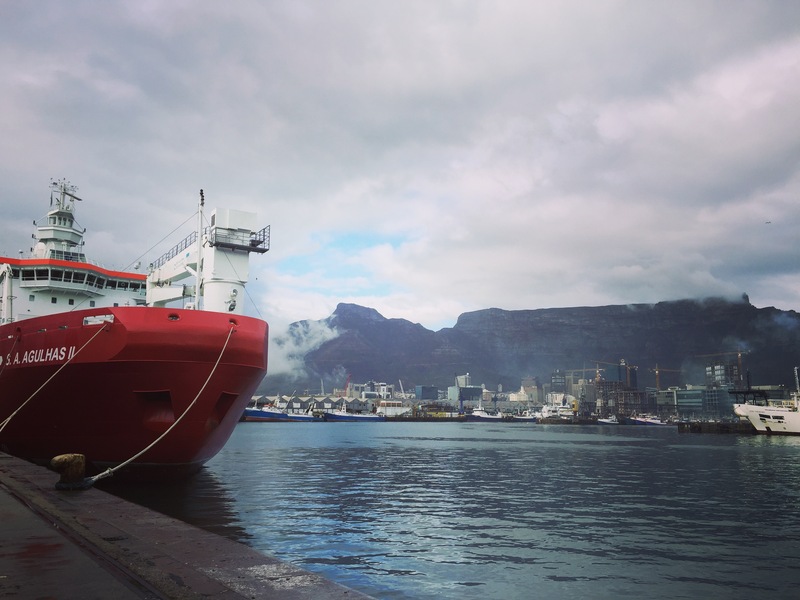 At approximately 03h00 on the morning of 28 July, the SA Agulhas II docked at Cape Town Harbour. After our last breakfast on board and a quick trip through Immigration we were off to find a robin in a tree, a task I thought to be akin to finding a needle in a haystack but the little bird had very considerately made its temporary range right next to the car park. After watching it flit between the trees and shrubbery, completely unaware of the total fuss it had caused throughout the birding circles of South Africa, we headed off for lunch and the ending of an epic adventure. An adventure made all the more epic by the people and characters who contributed their unique and colourful stories. 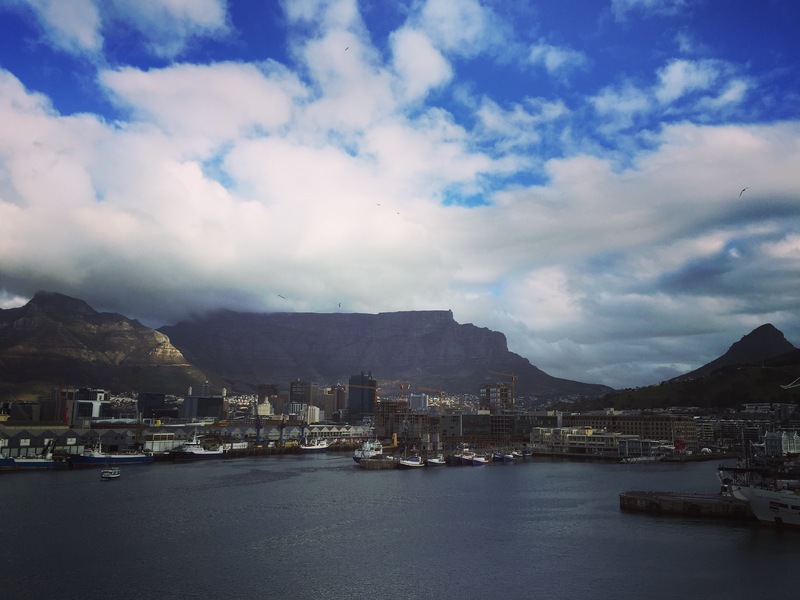 Sitting in my office in the concrete jungle of Cape Town I can often feel my thoughts being tugged back to the ice, back to the wild weather and back to the extraordinary birds of the Southern Ocean… and I know that my experiences with polar exploration are far from over. I would like to dedicate this, the story of my Antarctic Baptism, to Maya. I would like to thank the individuals and organisations who played a role in assisting me to realise my dream and for making my first voyage (disappointingly only ships can have maiden voyages so I will have to settle for being a maiden on the voyage) south, one filled with awesomeness! Thank you to Tammy Morris (SAEON), Taryn Morris (BirdLife SA) and Warren Joubert (CSIR) for going the extra mile and including me in the trip. Thank you to DEA for allowing me to participate in this awesome opportunity. 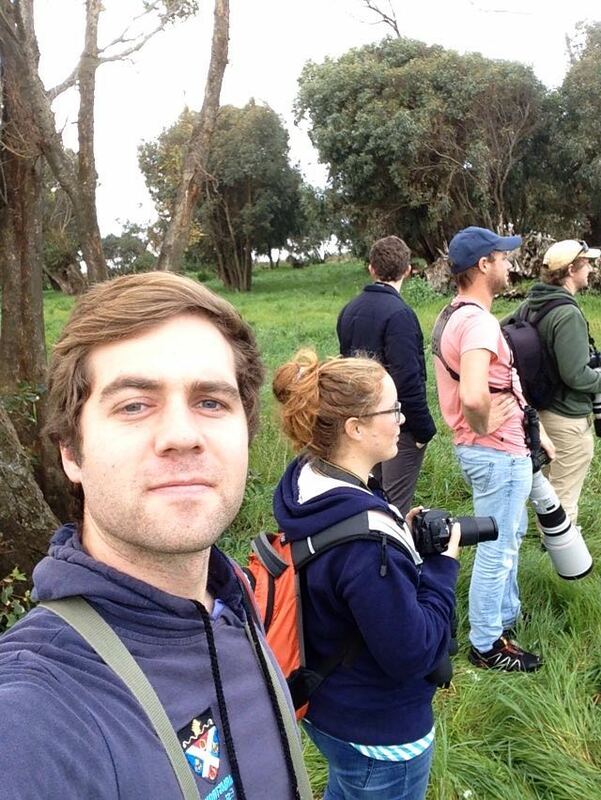 The BirdLife SA Crew; Andrew, Dom, Justin and Patrick; a huge thank you for putting up with my incessant questions, happily passing on your endless knowledge of all things birds and birding and for making the trip an hilariously unforgettable experience. Karin, thank you for being a great cabin buddy… good memories! 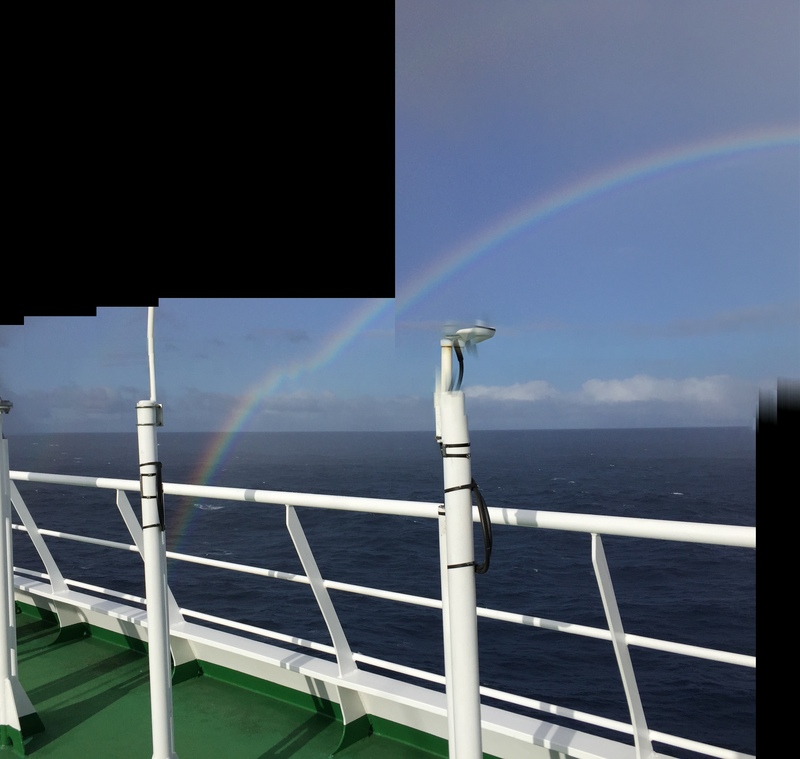 Last but by no means least; thank you to the entire 2016 Winter Expedition Team for making this trip so memorable and to the Captain and crew of the SA Agulhas II for ensuring our safe and comfortable passage to the MIZ and back. Eyers, J. 2011. Don’t Shoot the Albatross! : Nautical Myths and Superstitions. A&C Black: London. Speich S, Arhan M, Rusciano E, Faure V, Ollitrault M, Prigent A & Swart S. 2012. 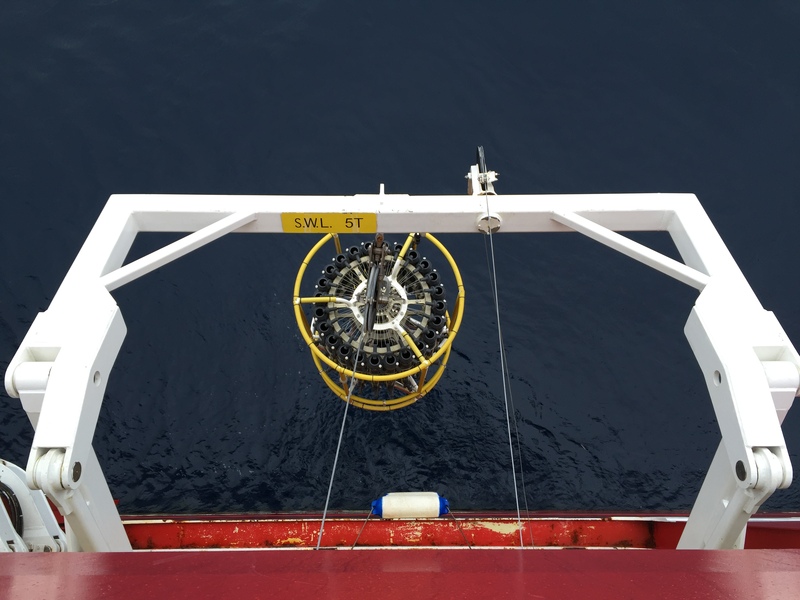 Use of Argo Floats to Study the Ocean Dynamics South of Africa: What we have learned from The Goodhope Project and what we plan within the SAMOC International Programme. 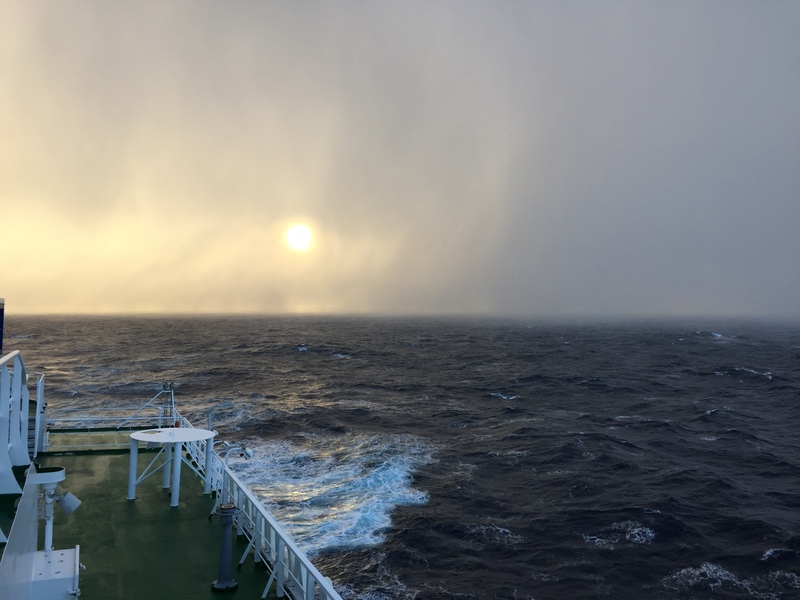 Mercator Ocean – Coriolis Quarterly Newsletter 45: 21-27. Fantastic Sally – great account, brilliantly written – love it MM!!! Thanks Gran, I’m glad you enjoyed it! 😊 I wish I could have shared it with Grandpa too. Thank you so much for your awesome words 😊 Haha, ja I’m sure no one would have noticed! Not sure why the comment duplicated there (‘~’) …Probably due to extreme excitement. Great writing Sally, and lots of great memories. Thanks! Thank you David. Yes, great memories…couldn’t have hoped for a better group of people with whom to share them 😊 Will work on my Bridge strategy! Sally, You write like one of the best storytellers, I have ever read, an amazing experience, and a great story. Thank you so much, I’m glad you enjoyed it! 😊 Looking forward to seeing you both on the beach next weekend! Hey Sal! Truly amazing! Once again I feel like I was there with you. Glad you are having such amazing experiences! Nature really is good for the soul. Thanks so much Celesté! 😊 I couldn’t agree with you more…Nature is my happy place ❤️ How your thesis is going well? !